The Palisade Bluegrass & Roots Festival is celebrating its 10 year anniversary. We are excited to announce our 2018 festival lineup, packed with everyone's favorite past performers. As the Palisade Bluegrass and Roots Festival celebrates its ten-year anniversary, we reminisce about the passing years. We remember our grassroots days when just 1,000 people gathered together to enjoy the friendly pickin’ in the park. We remember epic performances followed by camp ground jam sessions and nights that we never wanted to end. Throughout the past decade, as the festival has tripled in attendance and became one of the top bluegrass festivals in the state, the Palisade Bluegrass and Roots Festival has remained committed to continually delivering magical moments to Colorado festival goers. Our guests have shared their most memorable stories and we have recreated some of these magical moments with the ten-year anniversary program. We are excited to announce our 2018 festival lineup, packed with everyone’s favorite past performers. Junior Brown – Known for his exceptional song writing and “Guit-Steel” guitar, Junior Brown is an American original. Performing live since he was a young boy, this CMA and IBMA award-winning musician has created his own unique style of country music and released ten studio albums in the last 28 years. Della Mae – This all female bluegrass band plays charismatic, rootsy, soulful bluegrass that honors old-time traditions, yet is undeniably current. Della Mae has spread their gospel of peace and understanding through music in over 18 countries in the last decade. Their vibrant, original music has earned the band an IBMA award as well as a Grammy nomination in 2014. Known for great live performances, Della Mae promises to bring new creations and raw emotion to the stage. Trout Steak Revival – Defined by expressive songwriting and heartfelt harmonies, Trout Steak Revival crosses over the bounds of folk, indie, bluegrass and roots, evoking its own style of Americana. This Emmy Award-winning, Colorado band was named Denver Westword’s Best Bluegrass Band in 2017 and nominated for the IBMA Momentum Band of the Year award in 2016. Rapidgrass– Rapidgrass is a high-energy, fusion string-band made up of accomplished musicians from the Colorado bluegrass scene. Their newest release, Happy Trails, is inspired by the Colorado outdoor lifestyle. In the past five years, Rapidgrass has brought their inspirational Colorado mountain music to fans throughout the US and Europe. The front-range ensemble uses classical, gypsy, bluegrass, pop, swing and other world rhythms to create what can only be described as, Rapidgrass. Head for the Hills – Referred to by Bluegrass LA as, “rising stars of the acoustic string scene,” Head for the Hills is known as post-modern bluegrass that combines sounds from bluegrass, jazz, folk and soul. Their live performances showcase a wide-range of song writing and intricate improvisational chops. Released in May, 2017, the band’s fourth album, Potions and Poisons, has received rave reviews from industry critics, describing the album as poetic and energizing. Wood & Wire – Straight out of Austin’s bluegrass and acoustic scene, Wood & Wire has been touring the country for the last five years. Known for mixing elements of Americana and swing, this four-piece band keeps audiences on their toes with funky acoustic jams, a cappella ballads and rippin’ fast instrumentals. Wood & Wire honors the purity of acoustic instruments and the gorgeous music a skilled artist can coax out of just simple wood and wire. 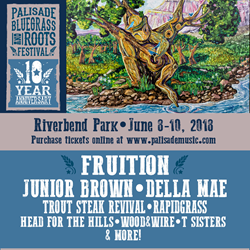 The Palisade Bluegrass & Roots festival will be held at Riverbend Park June 8 – 10, 2018. Early bird tickets are available for purchase at http://www.palisademusic.com. To become a vendor at this year’s festival please visit the website and click “FAQ” to locate the food truck and vendor application links. For more information, contact the Town of Palisade at 970-464-5602.